It seems that Sergio can talk to girls if he's screaming at the top of his lungs. And we just finished our very first round of Patreon and it was so much fun! 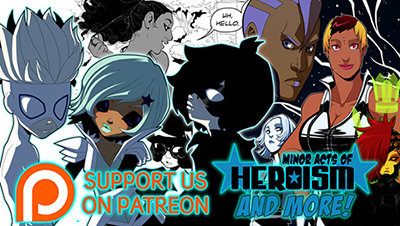 We made some really awesome stuff so if you haven't checked it out yet, have a look here: Patreon! WAIT, are sergio's pupils shaped like hearts? Am I the only one who noticed how sad it was that Simon was basically not allowed to have friends before Sergio and Nilus showed up. That's just sad. Sergio's eyes have looked like that since he discovered the stone and Baskervilles came about. Sometimes subtle due to angling it's been a pretty interesting hint that he changed in a fundamental way. Great Comic as an aside! Simon, poor baby, I cant wait to find out what he is doing! He spoke to her! Progress has been made! Aww, Simon must be really lonely before having Sergio and Nilus~! T-T I'm glad they're are such good friends and understand him well! Omg, what an awesome page. Sometimes there is such a great page like this that says so much with so little. That is what both Naima and Simon are really good at being alone, keeping their secrets. And Sergio's skill is poor lying, naivety, and poor deflection. Sergio why u so cute?! For Sergio that is. I mean, so far he's the most honest kid out of the bunch. Most sensitive too, if he eventually becomes a superhero, the adventures he's going to have won't be easy for him.